Telenor today announced its fourth quarter 2010 results, showing strong momentum going in the reported period. 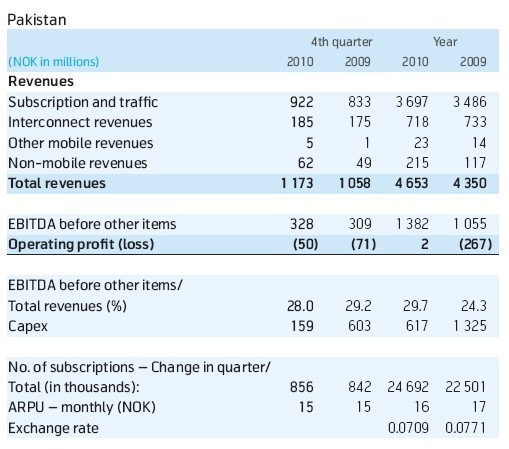 Telenor said that its Pakistan operations were able sustain revenues in Q4-2010 by slight margin and remained consistent when compared to previous quarter in 2010. While, revenues grew by 11 percent when compared to same quarter previous year. Telenor said it generated total revenues of USD 204 million dollars in fourth quarter, out of which, USD 10 million dollars were contributed by non-mobile (Easypaisa) services. The EBITDA margin decreased by 1 percentage point as a one-time adjustment of revenues and operating expenses more than offset the increased revenues. The EBITDA margin excluding these adjustments was 31%. Company said it was able to reduce capital expenditure with continued focus on network capacity investments to align with current subscription growth and traffic volumes. The number of subscriptions increased by 856,000 during the quarter, while the subscription market share increased by 1 percentage point to 24%, said the results. Telenor said that out of its 24,692,000 subscribers, 24,465,000 are prepaid while remaining 227,000 are postpaid subscribers. Telenor, in its stats revealed that ARPU for its postpaid customers remained at Rs. 773 during the fourth quarter, down from Rs.847 a quarter before. While ARPU for prepaid subscribers witnessed quarter-on-quarter consistency at Rs. 223. At group level, Telenor Group posted fourth quarter profit of NOK 2.1 billion, lower than NOK 2.17 billion last year. Earnings per share from total operations was NOK 1.28, down from NOK 1.31 in the prior-year quarter. Profit from continuing operations was NOK 2.21 billion, compared to NOK 2.5 billion in the same quarter last year. 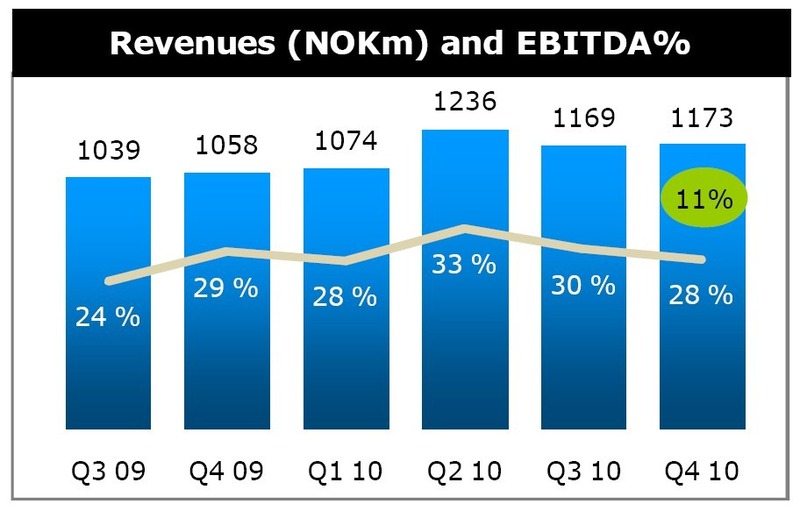 Earnings per share from continuing operations was NOK 1.22, lower than NOK 1.33 a year earlier. Revenues increased to NOK 24.86 billion from NOK 22.42 billion in the prior-year quarter.